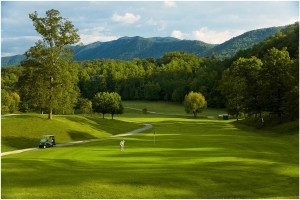 Laurel Valley Golf Course is a par 70, 6,331-yard course designed by Edmund B. Ault. The course is bordered by The Great Smoky Mountain National Park and the Laurel Lake Nature Preserve and offers picturesque views. Located on the peaceful side of the Smokies in beautiful Townsend Tennessee, Laurel Valley is just a short drive from Gatlinburg and Pigeon Forge, Tennessee.